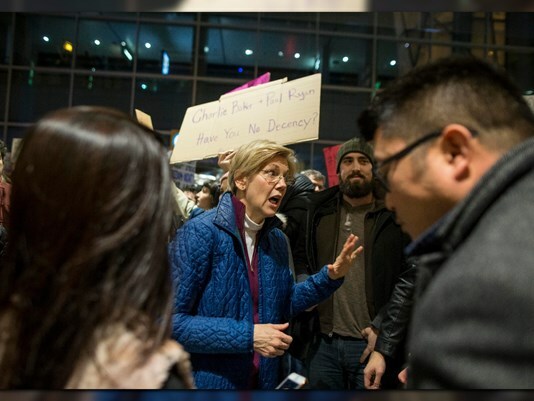 Progressive Chat: Senator Warrens grabs a megaphone and joins protesters Muslim ban at Logan International airport. Watch the Speech. Senator Warrens grabs a megaphone and joins protesters Muslim ban at Logan International airport. Watch the Speech. It seems like a fitting start to week two of the Trump crisis is a round two of protests across the nation's airports. These protests came amid turmoil caused by the travel ban issued by the Super Callous Fragile Sexist Nazi POTUS Executive Action barring entry to the US from seven Muslim-majority countries: Iran, Iraq, Syria, Sudan, Libya, Yemen and Somalia. It was amazing to see lawyers join the resistance and help on Sunday night those immediately affected and a special shoutout to the ACLU attorneys who got a national stay on Trumps Muslim ban issued in Brooklyn! Here is to more lawyers stopping the continuous madness we are facing and standing up for the constitution and American values.